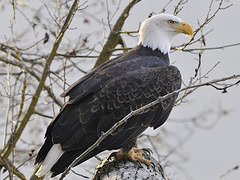 About the Alaska Chilkat Bald Eagle Preserve - The Alaska Chilkat Bald Eagle Preserve was created by the State of Alaska in June 1982. The Preserve was established to protect and perpetuate the world’s largest concentration of Bald Eagles and their critical habitat. It also sustains and protects natural salmon runs and allows for traditional uses, provided such uses do not adversely affect Preserve resources. The Preserve consists of 48,000 acres of riverbottom land of the Chilkat, Klehini, Tsirku and Chilkoot Rivers. The boundaries were designated to include only areas important to eagle habitation. Virtualy every portion of the Preserve is used by eagles at some time during the year. 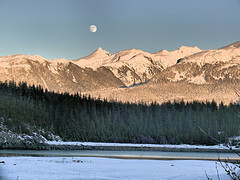 The river "flats" of the Chilkat River, along the Haines Highway between Miles 18 and 21, are the main viewing area for eagle watchers and are considered critical habitat in the Preserve. 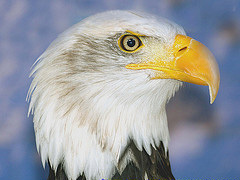 Bald Eagles are attracted to the area by the availability of spawned-out salmon and open waters in the late fall and winter. The natural phenomena - responsible for five miles of open water during freezing months is called an "alluvial fan reservoir." Water in this large reservoir remains from 10 to 20 degrees warmer than the surrounding water. This warmer water "percolates" into the Chilkat River and keeps it from freezing. Five species of salmon spawn in these waters beginning in the summer and continuing through late fall or early winter. The salmon die shortly after spawning and their carcasses provide large quantities of food for the eagles. The combination of this large food supply and warm water bring large concentrations of eagles into the Chilkat Valley beginning in early October and lasting through February. A total of two miles of surfaced off-road trails and 4,000 square feet of elevated boardwalk have been designed and constructed with pedestrian safety in mind. This million-plus dollar project was funded by State and Federal monies and constructed in three phases over two years.